Sweet. Already have these. One less thing! Haha. Thanks again. Well thanks to all the great feedback in this thread, I have decided to take the plunge and pull the trigger on a mobile-rig to complement the wired cameras. I think having both is the ideal situation if you can do it (as it allows greatest production capability - as was handy last year during the NWPC). 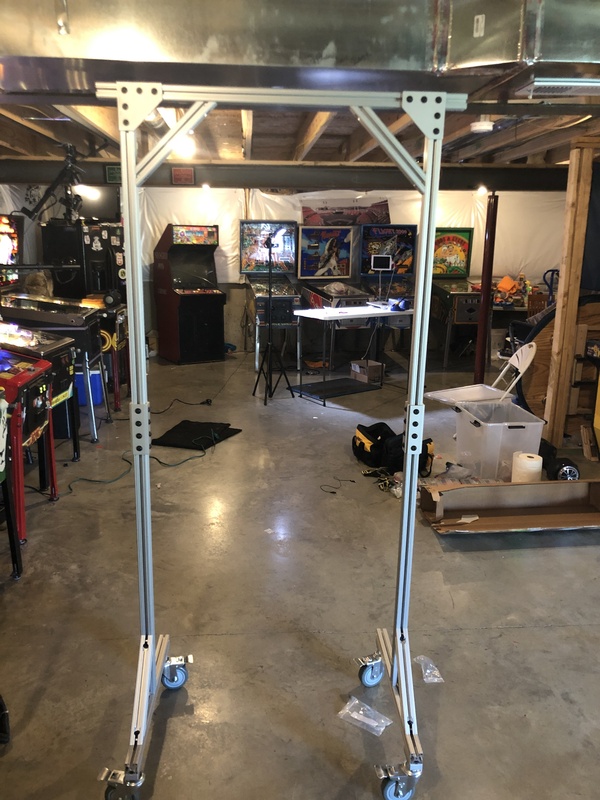 Hopefully everything will arrive in time for the 2019 Northwest Pinball and Arcade Show. (I will have it setup for use during seminars, casual play on the show floor, and the Women’s Tournament Final). Planning on lots of streaming coverage! Can’t wait! Went with @spraynard 's plans and ordered everything last night! Thanks again to Phil and Karl and everyone else for sharing these with the group. Hopefully these rigs will become common place and really help all the tournament streamers out there. The Monclas in Texas also just built one. Curious how many there are total. It’s a mobile rig revolution! I got all my parts for @spraynard ‘s rig design. Hey Phil, I noticed that your picture it appears to have 6 of the 45 degree supports when your BOM calls for 4. Does that mean the top two on your rig are unnecessary? Actually, that was a mistake, ugh. However, I think it will be fine without them. Karl’s doesn’t use them. @KingNine have you had any issues without the upper 45 degree supports? No worries. I can always add them later. Just wanted to be sure. Thanks for looking into it. Another thing you can do is use two on the bottom and two up top. Just put the bottom ones on opposite sides. Good idea. I may do that. I’m guessing this is the right thread to ask this question, but another could be opened up if necessary. I’ve got 3 cameras - Logitech C920 HD(https://www.amazon.co.uk/gp/product/B006A2Q81M/ref=ppx_yo_dt_b_asin_title_o09_s00?ie=UTF8&psc=1). I just don’t have a laptop that’s capable of (powerful enough) live streaming (although it can record, which I can then download). I don’t want to break the bank so am after recommendations as to a suitable laptop. What specs should I be looking for as a minimum? recommendations for a microphone also welcome. This thread is more for the physical rigging. Check out Twitch/livestream setups. for more general streaming help. All done! Went pretty smooth and seems plenty sturdy even without two of the supports. Hoping I can use this at home too and ditch my wired hanging rig. I’ll be testing the wireless transmitters as my basement is a 90 degree turn from the computer so I’m worried about line of sight. Looking sweet! i was suggesting flipping one of your bottom supports to the opposite side, so you have one in front, one in back. but I honestly doubt it matters. You have smooth floors so you wont have much stress when its moving. If you’re using the monoprice transmitters, you’ll definitely have line of site issues. If you connect your receivers to your computer with some long cables, you can move your receiver stand as needed to maintain line of site. Good idea on the long hdmi cables. I may do just that. We are not having any issues withouth the other two angle supports. We left them off the top as the bottom will get the most stress and the angle braces the join the top bar to the supports seemed plenty strong enough. If I had my druthers I’d probably rather have them but so far it is strong and secure! Where I think they might help is the feet seem to come inward about an inch from the top and they probably help keep them at a perfect 90 degrees. Not having them will make adjusting the width that much easier too.